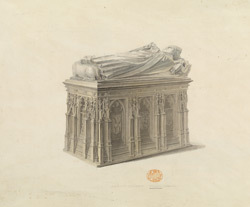 A tomb monument of Abbot Parker at Gloucester Cathedral, near the High Altar, opposite Abbot Sebroke's. This is the Abbey of St Peter's last Abbot, before the dissolution, who is also known as William Malvern. His alabaster effigy has full ecclesiastical robes including mitre (a title conferred by the Pope to very important abbeys). He is lying on a tomb chest which is highly decorative.